And then my legs stopped talking to me. And I can't decide if that's a good thing, because really...talking legs? That's just weird. But on the other hand...maybe they are secretly plotting my demise during tomorrow's "workout." And by "workout" I mean "trip to the place that sells candy." Because I've already walked up 2 whole hills this week. And I like my legs. And sleeping. And to be completely honest with you, I'm kind of thinking I should have done the whole sleeping thing before the post-writing thing. I might not approve of this post in the morning. But I'll still love these cookies. I made them for a barbecue themed baby shower. And even though that was a weird juxtaposition in my head...I kind of love them!! The ants are one of my favorites. Want to make some? 1. Make some royal icing transfer eyeballs. Basically...just pipe large dots of white icing on parchment paper and then pipe small dots of black on the wet icing. Let them dry for 24 hours before taking them off the parchment paper. 2. Turn the snowman cookie upside down and place a circle cutter on what is now the top of the cookie. Trace around it with a black food color marker. 3. Outline and fill the circle with medium consistency gray icing and a #3 tip. Drop eyeballs on the wet icing. Push them gently into place with a toothpick or scribe tool. 4. With medium consistency green icing and a #3 tip, pipe a wide "U" shape under the head. Let it dry for 15 minutes. 5. Grab some medium consistency pink icing and a #2 tip and pipe from one edge of the "U" shape to the other. You can give it some bite marks if you like, or just go straight across. Use the gray icing to pipe the body of the ant. Let it dry for at least 6 hours. 6. 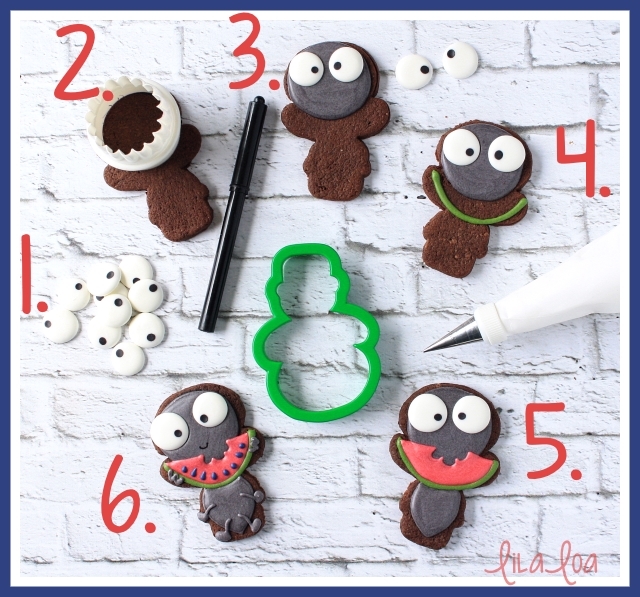 Add a smile with the black food color marker or thick black icing. Add 4 legs and feet with thick gray icing and a #1.5 tip. Pipe a "W" shape on either side of the watermelon for hands. Grab some medium consistency black (I used blue because it worked with my set.) icing and a #1.5 tip and pipe tiny little watermelon seeds. I find it easiest to pipe a tiny dot and then just drag it toward the center to create the seed shape. If none of that makes sense...it might be because you stayed up too late *NOT* making cookies like you were supposed to. (Yeay for team I'll-Just-Work-Harder-Tomorrow.) Either way...here's a video of it in action. Grab the cutters -- Picnic Ant, Diaper Pin Heart, Lemonade, Shish Kabob Rattle, Popsicle (I got the "regular" size), Grill, BABY plaque cutter. See how I made the BBQ GRILL cookies. Check out this GENIUS watermelon slice tutorial from Sweet Sugarbelle. Watch my design process for this set of cookies HERE.